This entry was posted in Elections 2012, Mitt Romney and tagged Barack Obama, Ohio, Pennsylvania, Unions, Wisconsin. Bookmark the permalink. Early voting in Iowa is big, and reports I’m hearing is that Romney will have trouble taking that state. Colorado will also be a GOTV test — it also has more than half its votes cast early, and if Obama’s ground game is as good as they say, it could make a difference there. If Obama’s ground game is really big (and if early voting is more important than some think), North Carolina could go blue again – what’s your read on early voting there? New Hampshire to me remains a toss up. The polling there has been ambiguous. I still think Obama will get a mini-bounce from debate 3, which could also affect the very close states, perhaps even Florida where the ground game is also big. 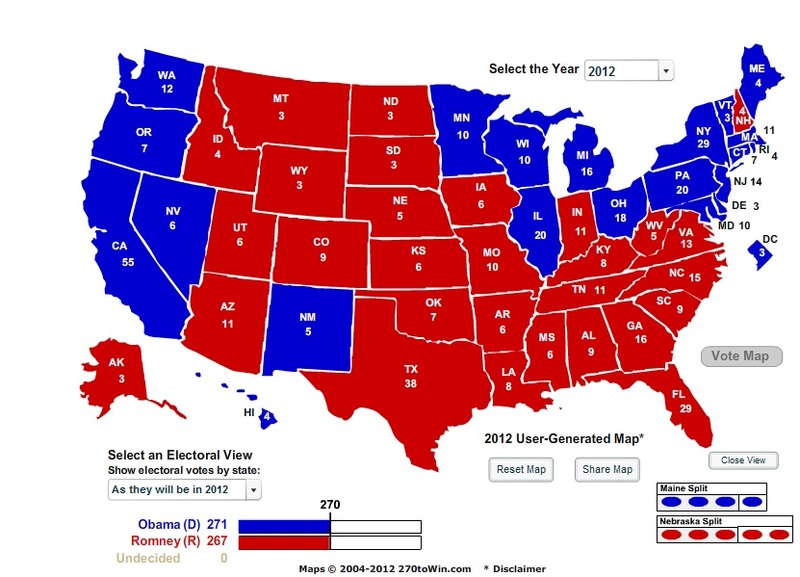 If your map is accurate, then Romney is right to be focusing so much on Ohio – anything can happen in 12 days! How do you know? The cycle isn’t over yet.